So another week's gone by and I lost a kilo exactly. 2.2 lbs. I'm happy with that. I hope it just sticks to a steady loss. This week, I feel like I was better in some things and worse in other ways. Like on Thursday we were invited to a birthday party and I skipped dinner to have a piece of cake. I also used about a quarter of my points today to have a couple of THESE that I made for the kids today. It's Safiyah's 6th birthday and she requested the chocolate-chocolate chip cookies. 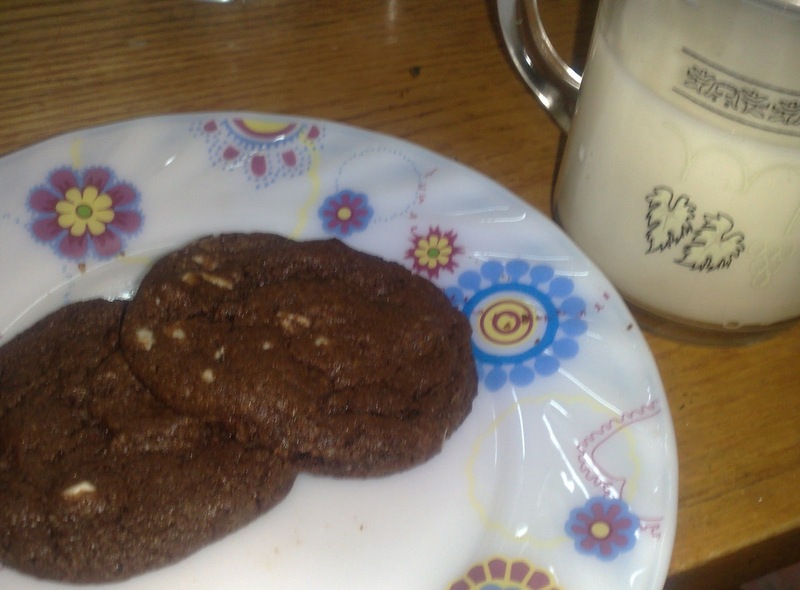 They are so good, I'm telling you, just THE best double chocolate chip cookies. The kids had a couple of days off school this week for a national holiday (Oct6, war holiday) and I didn't go walking on those days but the last time we walked longer, We're doing an hour instead of 40 minutes now and I just love it. I feel good. I'm drinking a lot more water. I put some lemon in it to keep it interesting sometimes. For breakfast I usually have a bowl of corn flakes mixed with fiber cereal, musli and skim milk, sometimes a sliced banana in there too. Later I'll have a light yogurt or fruit. I start off my dinner with a big salad. I'll put lettuce, tomatoes, cucumber, green and yellow peppers, mushrooms and shredded carrot. For dressing a Tbsp of Olive oil and lemon, salt and pepper. It tastes good and fills you up so you don't want to eat as much. I'll usually have a small portion of chicken or meat and veggies. If I have macaroni for the kids, I'll add a little bit to my salad. Roasted cauliflower with garlic prooved to be delicious. Also a good snack is air popped popcorn. 3 cups is just one point and it satisfies that crunchy craving and fills you up. I make it over the stove, in a pot old school style and add some salt. Good stuff. So that makes my 2 week loss 6.6 lbs or 3 kilos. I'll take it. I'm really looking forward to seeing and feeling a real difference in my clothes etc. InshaAllah. That is a lot in 2 weeks. Congratulations and good luck for the rest of the way isa! salams sis. Mabrook! thats soo go0d Masha'Allah. Mona, Thanks. It's not so easy but I'm trying. Mashallah! That is an amazing accomplishment. I am struggling with weight loss, so this is really an inspiration.